Hi! Great page, nice collection! I Myself have quite a few russian cameras: Lubitel 2, 2 Zorki 4, and I just recently found a Chaika 2. I have tried to find an intruction manual for this camera on the internet, but not succeded. Can you help me with this? Great webpage, reminds me of the old, good days and the adventure with my first SLR - Zenit 12 XP. Why do you think Zenit-35F (compact) is a mysterious one ? I used to own one... they came in a nice, plastic box with English manual. Unfortunately it broke very quickly. Maybe I should not have thrown it out ? Great! very very good! thank for your job. Labai profesionali, idomi svetaine. Matosi, kad sukure fotozinovas. Идея хорошая, с наполнением тоже вроде вот ничего, но вот что фото камер такого поганого качества? Nice website. Very informative. I wish you had more info on the Skolnik. I'm looking for a manual in english. Yeah, I know wishful thinking. I want to thank you for this amazing resource!! 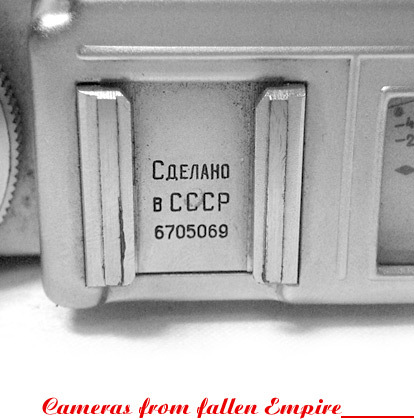 As a recent soviet camera collector this site had been a tremendous resource as a reference for my own collection. I just started so I visit your web site a few times a day! It's just excellent. Check out the start of my collection on Squirl (a great site for collectors by the way). http://squirl.info/collection/show/1964 I've used some of your site content for some of my descriptions, but I gave you full credit for it in my collection description. I hope you don't mind. very nice website! keep up the good work! Es una página valiosísima. Gran trabajo que nos orienta gratamente. Felicidades. Estupenda página! Muchas gracias por tu trabajo. One of the best presentations of Soviet cameras I have seen. I liked the information about Soviet spy cameras very much . Keep it up!